Korona’s 132-hectare farm consists of 102 hectares of Typical and Arusha coffee trees and 30 hectares of undeveloped conservation land. Located about a 40 minutes drive to the southeast of the town of Kainantu, the farm is located in some of the Eastern Highlands’ best coffee growing land. Its coffees are selectively hand-picked and delivered to the farm’s wet mill on the same day to be floated and then pulped. After pulping, the coffee is fermented for several days and then washed using clean water diverted from a nearby creek. Parchment is delivered to dry on raised drying beds – where they are again sorted - for a maximum period of 5 days. During cloudy and cool days, the time drying extends to about 7 days. 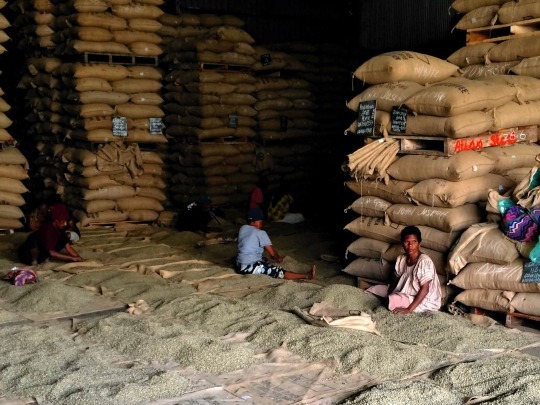 Some coffee is also dried using the traditional method on tarpaulin sails on the ground.